Okay...so People are getting fired up with Jack. He's being a whiny little B-----. Well Wouldn't you if people were plotting stuff against your back? That's 2 episodes in a row where Locke and someone else are conspiring against him. Then again, Jack is building an army behind everyone's back too....so who is he to talk? Sounds like there are some big inner conflicts brewing within the Fuselage Survivors that is bound to blow up. I thought this was going to happen last year when Locke played a part in Boone's death. Should've known it would take a whole other season to actually develop! So who is Henry Gale? Well, anyone remember the story of The Wizard of Oz where Dorothy Gale is swept away to the magical land of Oz? She had an Uncle Henry, and to my recollection, he did some Balloon traveling himself! And one part I don't recall is if the people in Dorothy's life (In Kansas) actually play the roles of the characters in OZ. I'm pretty sure I remember the actor who played Uncle Henry also portrayed the WIZARD in Oz. And the wizard also sends Dorothy back in a balloon. So...this is a good indicator that our boy Henry on the island is totally lying! Not to mention he couldn't recall where he buried his wife. But I gotta say, he was a convincing liar up to then! And Rousseau said it would take a lot to crack him. And what is up with Rousseau? Do we think that she is with THE OTHERS and the whole capturing of Henry was a setup? She was acting quite shady about the whole thing. Then again....I don't know if part of a setup would be to shoot an arrow through someone! Let's take a break from the Hatch business. So we finally know how Hurley has remained pleasantly plump. He has a hidden stash of Dharma food! So what was his secret before Season 2? Well he had told Arzt it was going to take awhile for him to lose the weight because of how heavy he is. Looks like the producers covered every angle! So here's a question....can a tub of ranch dressing really keep people fat? I need to rewatch to see what else he had hidden there. But At least we know he's good for 7 years! Speaking of Hurley, we were reminded that Sawyer is a bad man...or wants people to hate him...as he disregarded Hurley's option to send the loud tree frog to another location on the island. Instead Sawyer squishes it to death and offers it to Hurley to eat with his Ranch Dressing Good times.! New Nickname Alert.....Sawyer calls Hurley BARBAR and is quickly corrected that it is Babar! outstanding! I had heard on P&S that someone said there was a Dharma logo on the tree frog. I seriously doubt it, I'll have to rewatch later. Okay...so was anyone else looking at Military Officer #1 and scratching their head as he talked to Sayid about being a translator? I couldn't quite place him...but I knew I had seen this guy in some form of a show before. 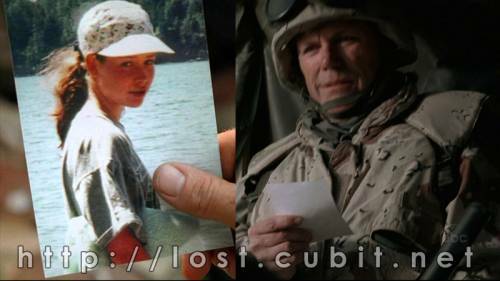 Turns out it WAS Lost...and I didn't recognize him fully until he whipped out that picture of Kate at the end. Yep...it's Kate's Foster Father (whom Kate thought was her Dad for the longest time). I'm still kicking myself for not catching on sooner. We're seeing a lot of backstories crossing over now between our fellow survivors. Makes things a whole lot more interesting in the present day. Here's a Pic! That first symbol isn't very clear, but we do have a potential translation to what it might mean. I'm not going to argue with it because I don't know how to translate heiroglyphics! No idea, but it can't be good news either way! Any input that you guys have found here would be welcome! All I know is....it was AWESOME when it happened! Moving on - Sayid and Charlie had a little conversation at the end stating that Jack and others had forgotten that Charlie and Claire were kidnapped by Ethan. Charlie was strangled and almost died.....Claire doesn't even remember 2 weeks of her life on the island. More internal conflicts.....and a war is brewing. But who is the war with? The Others? Or with Themselves? Ahhhh beautifully written show. So this episode was mostly a tease of things to come. From the producer's insight about the episode on the podcast, this sets up the NEXT CHAPTER of Life on the island and really sets events in motion that will take us through then next 4-5 episodes.....and even the entire future of the show. We see that the next episode (in 2 weeks??) we will find out what happened in the days when Claire was missing. Could this mean the return of ETHAN? yeah...I'd say so. 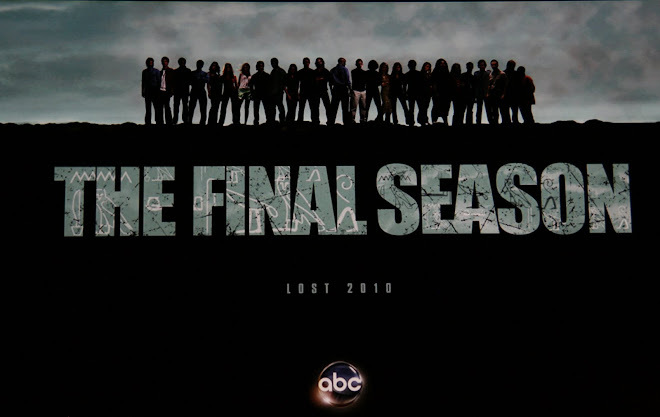 We WILL find out why the Plane crashed by the end of Season 2. We WILL see Desmond again in Season 2. I thought I had more, but I think that's it. So...I guess the 2 hour Idol and the olympics are scaring Lost into not airing an episode. Very rare that a network would not air as many episodes as they can during February Sweeps. But whatever the case, we're 2 weeks away from finding out about Claire...and maybe more about Henry. If you guys have any extra information I missed (I admit, I didn't do much research), feel free to post in the comments section! See everyone for Ep 15! (fyi...for some reason it's posted on the 212 episode page. They will probably change this to "213.html"
So, did anyone catch Kate's Mom serving Sawyer in the diner? Once I saw that hand hit the table with the food, I knew it had to be her. 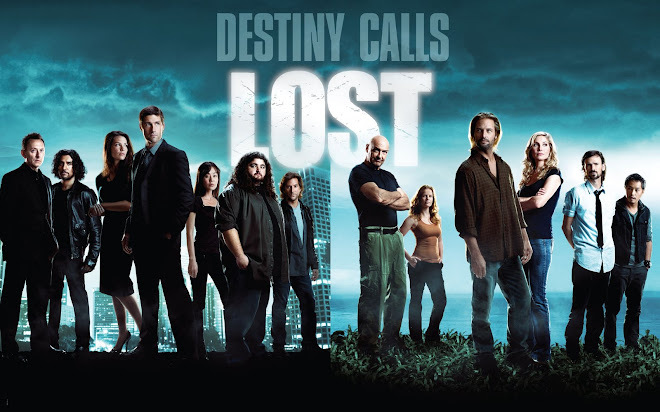 Granted, I did know in advance that there would be some character "crossover" in the episode from the Lost podcast, but I was still quite impressed with myself for catching it! Long story short, Sayid gets it to pick up a signal that plays some Glenn Miller music.... Apparently the radio station letters "WXR" - were the call letters used for Coast Guard Radio in Kodiak, Alaska in 1945. Someone noted on P&S that they also mention Goodwyn in the radio broadcast as one of the DJ's. Not sure about that. I'd need to verify by rewatching! Glenn Miller also disappeared in a Plane over the English Channel in 1944. Sayid said that the radio waves could've bounced all over the ionosphere and allowed them to receive it. Hurley makes a joke reference to "Or another time........just kidding dude" A little shout out to all of the time travel reference Losties are making. Bernard's a dentist. Maybe we're going to have a "Very Special" episode in the near future where the smoke monster or Zeke has gingivitis and comes to Bernard for the cure! Charlie got his revenge on Locke after the beating he got last episode. And didn't want the heroin. He also took out his aggression on poor Sun.... Any bets that she'll find out Charlie did it? Yeah...it's a no brainer. Book Locke was looking through as he was "alphabetizing" was "Occurence at Owl Creek Bridge" Can you believe that I actually read this thing in High School? What a great short-story. It's about a guy that is about to be hung but the rope breaks and he goes on an amazing journey to escape the clutches of his enemies (or officers of the law...i forget!) Anyway....we find out in the end of the story that it was all in his imagination between the time that he got pushed off the cliff and ultimately is hung and killed. Yep....another allusion to the fact that this is all a dream! But it's just a teaser from the writers/producers. That won't be what we ulimately find out about our Lost Castaways (or will it??? I'd be fired up!). Also...I don't think Locke was alphabetizing....he probably is just trying to make sense of what has been happening. He thought that the hatch was going to provide him answers and he's getting frustrated....(hence taking is aggression out on Charlie)..... Did I figure this out on my own? no no.....Lost Podcast people! Subscribe to it!!! "About the AuthorBad Twin is the highly-anticipated new novel by acclaimed mystery writer Gary Troup. Bad Twin was delivered to Hyperion just days before Troup boarded Oceanic Flight 815, which was lost in flight from Sydney, Australia to Los Angeles in September 2004. He remains missing and is presumed dead. " Says for sale May 2nd. Maybe they actually WILL release it! lol. Also look here http://www.hyperionbooks.com/author.asp?ID=Troup Pretty cool stuff eh? Jack, Sawyer, Kate, Ana Lucia Love Rectangle is getting a lot more interesting. Jack, although angry with Kate, still went on her advice to question Ana Lucia on the Sun beating. And Sawyer orchestrated the whole thing....making Kate once again lean more towards Jack than Sawyer....but where is Jack leaning? Ahhh these writers are brilliant. 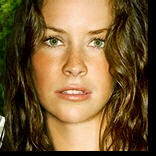 Evangeline said in the Lost Podcast interview segment that we shouldn't expect Kate to make a decision in this season. Well I know I didn't expect one! And of course, Sawyer's got the guns. A caller into P&S mentioned that the guns are actually probably safer with Sawyer than with the braintrust of Jack/Locke as he will only whip them out when they are needed. But we'll see where that story goes. Sawyer has reminded us that he is not someone "everybody loves" and thank god for that!!! But Kate is probably right, he just wants to be hated for the person he has been in the past. Update from "Fire + Water"
Remember I said I heard in the podcast there was supposed to be some writing on the building in the Charlie flashback? Well if you read the comments in the last recap, we did find out that the building is from a Pink Floyd album cover. But the writing on the wall (thanks to the Lost Podcast) we discovered said "Widmore Construction." Doesn't mean much now, but the producers noted it would be wise to write it down! Probably something of the Hanso Foundation similarity.